An online qualifier for SoCal Regionals 2016! The winner receives a flight to SoCal Regionals 2016 + a custom smashgg hoodie! 1st in Circuit Points = Flight to SoCal Regionals 2016 + a custom smashgg hoodie! All of Top 4 = A discounted venue fee for SoCal Regionals 2016 + a smashgg hoodie! Tournament begins at 6:00 PM PDT / 9:00 PM EDT September 8, 2016. Make sure you go to your “Dashboard” to play your matches, beginning at the scheduled start time. 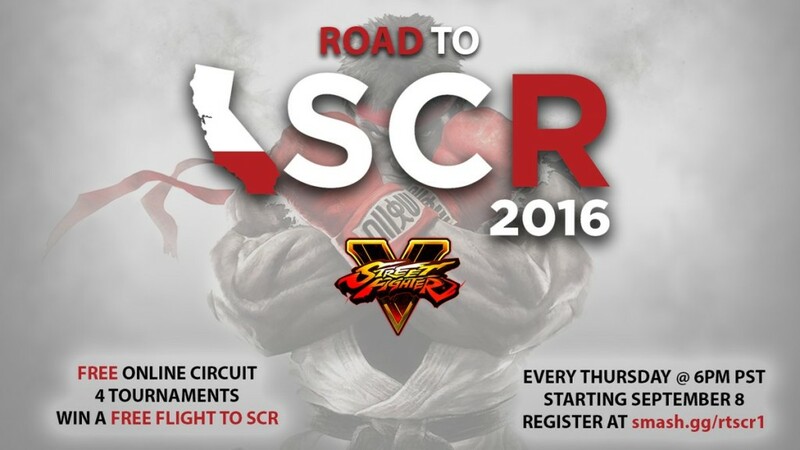 Is this an online Street Fighter V tournament? Yes, this is an online tournament for Street Fighter V. You will be using the online network for SFV. You will set up your lobby to play with the available smashgg chat, and then self report results via the online system. For more information, see the question below. How do online tournaments work on smashgg? We have a helpful guide on how this works by following this link to the smashgg help center. Only USA and Canada may participate in this online event. What is the minimum internet speed I should have for this event? The minimum recommended upload speed is 2Mbps upload & 5Mbps download. Use the http://speedtest.net to figure our your internet connection speed. Where can I find more information about SoCal Regionals? Please visit the SoCal Regionals smashgg page to view more information and register for the event.